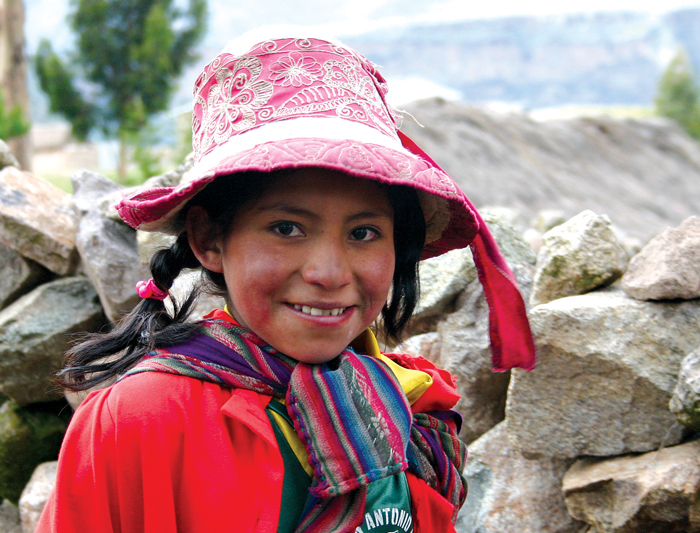 Journey through the Andes on this Overland adventure into ancient Inca heartlands. Unlock the secrets of the many mystic sights as you explore the isolated islands dotting Lake Titicaca, hike along historic Inca pathways, marvel at the Nazca Lines, ramble over the ruins of Machu Picchu and explore the streets of Cuzco. From the breathtaking highs of La Paz to the colonial sights of Lima, journey through Bolivia and Peru and discover two real South American gems. A Note on Altitude: If you are joining in La Paz, we suggest arriving 24 hours before the trip begins to allow additional time to acclimatise, or taking the first day very easy! A Note on our Community Trek: From July 2016, we have renamed our flagship Community Trek, The Wild Andes Trek, we feel this sums it up pretty well - trekking in the remote, pristine mountains of Peru. The only thing thats changing is the name - Dragoman's commitment to genuine, responsible tourism remains at the heart of the trek and the route remains the same, so rest assured by opting for this trek you are supporting communities and protecting the environment. Border information: if you are joining in La Paz, you will most likely enter Bolivia at La Paz El Alto International Airport (IATA code: LPB). Welcome to La Paz, Bolivia’s seat of government and the highest administrative capital in the world! There will be an important group meeting at 6:00pm at the joining hotel - please look out at the hotel reception for a note from your leader with more details about this important meeting. Please note that many of the options listed below will only be possible for those with extra time in La Paz before the start of your trip with us - please contact the Sales team if you would like to book pre-tour accommodation with us to have extra time exploring La Paz. In La Paz we will stay in a good hotel in the historical centre. Hotel for the night: Estrella Andina Estrella Andina Avenida Illampu 716 Zona El Rosario La Paz Bolivia Tel - +591 2245 6421 OPTIONAL ACTIVITIES Take the spectacular downhill mountain-bike trip down the infamous 'World's Most Dangerous Road', a 3,500m descent from the high mountain plateau near La Paz to the steaming jungles of Corioco via the dramatic road cut into the cliff : USD 110 Take a trip out to the mountain resort of Chacaltaya and the other-worldly landscape of the Moon Valley near La Paz : BOB 120 Take a guided tour to explore the amazing preInca ruins of Tiwanaku, once the centre of one of the most important cultures in South America : BOB 180 Take a guided tour of the main sights and viewpoints around La Paz : BOB 60 Discover Bolivia's history, art, and culture in some of La Paz's many museums such as the San Francisco Museum and the Museum of Ethnography : BOB 20 About La Paz: Bolivia's largest city of La Paz is spectacularly located lying huddled in a canyon basin, hiding from the harsh conditions of the surrounding altiplano. It is a fascinating city - the old town and more expensive neighbourhoods at the bottom of the canyon in the centre, surrounded by sprawling shanty-towns which extend up the slopes of the bowl, merging into the huge Aymara district of "El Alto" back on the plains, a suburb of La Paz that has grown to be a city in its own right. The city skyline is dominated by the snow-capped peaks of Mount Illimani, a staggeringly beautiful backdrop that leaves many visitors stunned when then catch their first glimpse of the city as they descend into the canyon. The old town is full of markets and winding cobbled streets full of people in traditional Aymara clothing selling anything and everything you could ever think of, including dried llama foetuses on sale in the witch's market! There are plenty of other activities to do in La Paz, including the famous downhill bike ride through the Yungas on the 'world's most dangerous road'! Today we will head to the beautiful town of Copacabana on the shores of Lake Titicaca, where we will have some time to freely explore. In Copacabana we will stay in a basic local hotel. Estimated Drive Time - 4-5 hours (please note that all drive times given here are the approximate number of hours that the truck will be in motion only, and does not include any time taken for coffee or lunch stops, border crossings, photo stops, activities en route, comfort breaks, shopping stops, toilet stops, etc. The times given are approximate estimates only and whilst given with the best of intentions, the drive times are heavily dependent on traffic, road conditions, weather, police roadblocks, and many other factors - flexibility is essential on any overland trip!). About Copacabana: Copacabana, Bolivia, is quite different from the famous Brazilian beach that shares its name, but both are wonderful destinations to visit! It is a picturesque small town on the shores of Lake Titicaca, centred around its small whitewashed square which is home to a pleasant Moorish-style cathedral. At sunset there is no better place to be than sat at one of the many simple local fish restaurants on the shoreline, watching the sun slip down behind the horizon. Today we will take an included day trip to Isla del Sol in Lake Titicaca, one of the holiest sites in ancient Inca mythology and supposedly the birthplace of the Sun God Inti. We will take a 14km walk across the length of the island, taking in the incredible and serene scenery and soaking up the calm atmosphere of the island (this walk can be skipped by anybody who does not want to do it). In Isla del Sol we will stay in a basic local hotel. INCLUDED ACTIVITIES Take a boat trip to Lake Titicaca's Isla del Sol, and head on a guided walk across the length of the stunning island : Included in Kitty About Isla Del Sol: Isla del Sol is a serene and peaceful island set in the glittering Lake Titicaca off the shore of the Bolivian village of Copacabana. The island was famous in Inca mythology as the supposed birthplace of the sun-god Inti - a legend that is still told by many of the modern-day Aymara and Quechua peoples of the area. There small ancient ruins dotted on the island, as well as tiny traditional villages and beautiful walking routes. You can take a boat trip to the island and wander through its atmospheric landscape, exploring the island's dry slopes covered with sweet smelling incense brush, or hike over the ancient pampas which are still cultivated by the island families. Border information: exit Bolivia at Kasani, enter Peru at Yunguyo. 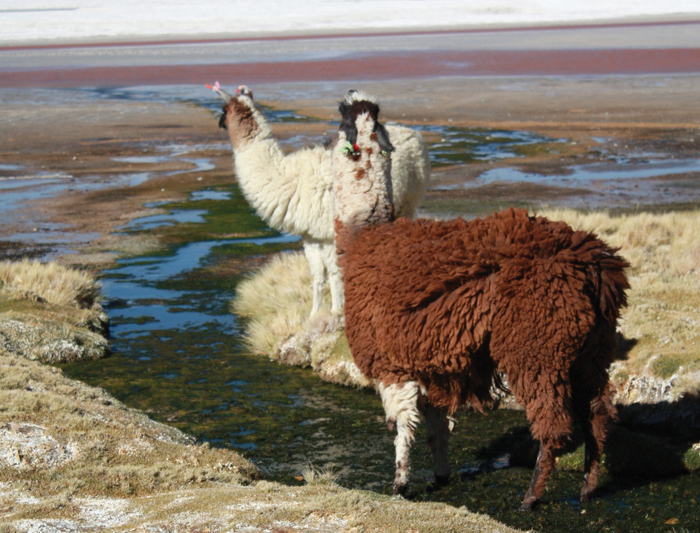 Today we will take a boat back to Copacabana, and then cross the border into Peru and head to the lakeside town of Puno. In Puno we will stay in a local hotel. Estimated Drive Time - 4-5 hours. About Puno: Located on the shores of Lake Titicaca in the south eastern region of Peru is the small town of Puno. The town is a melting pot of Aymara and Quechuan Indian cultures and traditional Andean customs are still strongly represented here. Lake Titicaca is the highest navigable lake in the world, and a mythical expanse of deep blue waters dotted with islands, some of which are still home to communities who have been living in the same way for hundreds of years. Today we will leave Puno and head through the highlands of Peru to the former Inca capital of Cuzco. We will have an included visit to the Inca site of Tipón en route. In Cuzco we will stay in a good colonial hotel. Estimated Drive Time - 6-7 hours. INCLUDED ACTIVITIES Visit the incredible Inca site of Tipón, once an agricultural centre and a park for the Inca elite : Included in Kitty About Cuzco: The Inca Empire was the largest empire in the pre-Columbian Americas - the civilisation arose in the early 13th Century under the leadership of the first Inca ruler Manco Capác, founding the city of Cuzco as their capital. The civilisation thrived in the area until 1438, when the new leader Pachacuti embarked on a massive campaign of expansion and used military conquest and peaceful assimilation to incorporate a massive portion of western South America under his control - at its largest, the Inca Empire stretched all the way from southern Colombia through Ecuador, Peru, Bolivia, northwest Argentina, all the way down to central Chile. In 1526, the Spanish conquistador Francisco Pizarro first entered Inca territory from his expedition through Colombia. After quickly determining that it was evidently a civilisation of great wealth and power, he quickly received royal permission to conquer the empire - he decisively kidnapped and later executed the Inca ruler Ayahualpa in 1533 and installed their own puppet ruler, Manco Inca Yupanqui. The new leader quickly turned on the invaders and briefly took control of Cuzco for the Incas again, until the Spanish finally pushed them back permanently from the city. The remnants of the civilisation formed a Neo-Inca state centred around Vilcabamba in the mountains above Lima until the Spanish invaded them completely in 1572, ending the last major resistance to their rule in Peru. Any adventure tour to Peru naturally centres around the stunning city of Cuzco - it is world-famous as the gateway to the spectacular ruins of Machu Picchu and the various Inca trails through the Peruvian highlands. However, the city is a fantastic destination in its own right, and many of its buildings still retain some of the original Inca stonework as part of their structure. This unique and intricate stonework was an ingenious construction method that prevented damage from earthquakes - examples of their amazing building techniques can still be seen in and around Cuzco, including the famous 'twelve-sided stone', now part of the logo of Cuzco's native Cusqueña beer! A good place to start your explorations is the majestic main plaza, surrounded by cobbled streets lined with attractive colonial buildings. Head up the hill into the neighbourhood of San Blas and you will discover another hidden square with a quiet laid-back feel. All the streets are lined with shops, bars and restaurants, from small local cafes to five star dining experiences. There are also some fantastic museums and historical sites in and around the city, showcasing the wonderful history and culture of the Incas. A Note on Altitude: If you are joining in Cuzco, we strongly recommend arriving at least 24 hours before the trip begins to allow additional time to acclimatize. A Note on our Community Trek: From July 2016, we have renamed our flagship Community Trek, The Wild Andes Trek, we feel this sums it up pretty well - trekking in the remote, pristine mountains of Peru. The only thing that's changing is the name - Dragoman's commitment to genuine,responsible tourism remains at the heart of the trek and the route remains the same, so rest assured by opting for this trek you are supporting communities and protecting the environment. Border information: If you are joining in Cuzco, you will most likely enter Peru at Cuzco Alejandro Velasco Astete International Airport (IATA code: CUZ). There will be an important group meeting at 10:00a.m at the joining hotel - please look out at the hotel reception for a note from your leader with more details about this important meeting. There will be a further meeting this evening for our Wild Andes and Classic Inca Trails, where we will have a full detailed briefing from our local trekking guides about the next few days! The rest of today will be free to explore the wonderful city of Cuzco, discover its many historical gems, or to take part in number of optional activities near the city. Please note that many of the options listed below will only be possible for those with extra time in Cuzco before the start of your trip with us - please contact the Sales team if you would like to book pre-tour accommodation with us to have extra time exploring Cuzco. In Cuzco we will stay in a good colonial hotel. Hotel for the night: Hotel Cahuide Hotel Cahuide Calle Saphi No. 845 Cuzco Peru Tel - + 51 8422 2771 About Cuzco: The Inca Empire was the largest empire in the pre-Columbian Americas - the civilization arose in the early 13th Century under the leadership of the first Inca ruler Manco Capác, founding the city of Cuzco as their capital. The civilization thrived in the area until 1438, when the new leader Pachacuti embarked on a massive campaign of expansion and used military conquest and peaceful assimilation to incorporate a massive portion of western South America under his control - at its largest, the Inca Empire stretched all the way from southern Colombia through Ecuador, Peru, Bolivia, northwest Argentina, all the way down to central Chile. In 1526, the Spanish conquistador Francisco Pizarro first entered Inca territory from his expedition through Colombia. After quickly determining that it was evidently a civilization of great wealth and power, he quickly received royal permission to conquer the empire - he decisively kidnapped and later executed the Inca ruler Ayahualpa in 1533 and installed their own puppet ruler, Manco Inca Yupanqui. The new leader quickly turned on the invaders and briefly took control of Cuzco for the Incas again, until the Spanish finally pushed them back permanently from the city. The remnants of the civilization formed a Neo-Inca state centered around Vilcabamba in the mountains above Lima until the Spanish invaded them completely in 1572, ending the last major resistance to their rule in Peru. Any adventure tour to Peru naturally centered around the stunning city of Cuzco - it is world-famous as the gateway to the spectacular ruins of Machu Picchu and the various Inca trails through the Peruvian highlands. However, the city is a fantastic destination in its own right, and many of its buildings still retain some of the original Inca stonework as part of their structure. This unique and intricate stonework was an ingenious construction method that prevented damage from earthquakes - examples of their amazing building techniques can still be seen in and around Cuzco, including the famous 'twelve-sided stone', now part of the logo of Cuzco's native Cusqueña beer! A good place to start your explorations is the majestic main plaza, surrounded by cobbled streets lined with attractive colonial buildings. Head up the hill into the neighborhood of San Blas and you will discover another hidden square with a quiet laid-back feel. All the streets are lined with shops, bars and restaurants, from small local cafes to five star dining experiences. There are also some fantastic museums and historical sites in and around the city, showcasing the wonderful history and culture of the Incas. These four days will be spent either trekking in the Andes, on our pioneering Wild Andes Trek, on the Classic Inca Trek or for those not wishing to hike, free time to explore and a guided tour of the Sacred Valley on our Train package. Option 1 - Wild Andes Trek Leaving Cuzco early in the morning, we visit the ruined temples of Sacsayhuaman for a fascinating tour of the site. 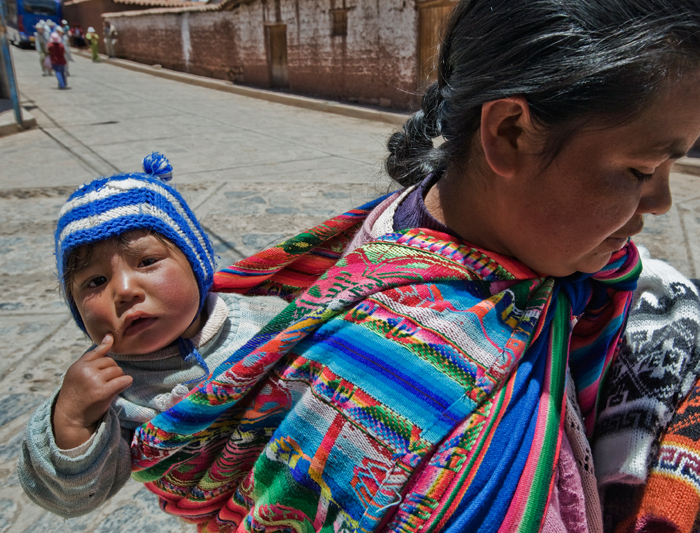 We then head on to Chinchero, a small Quechua-speaking village in the Sacred Valley. Here we will see a traditional weaving demonstration that has been unchanged for a thousand years, and explore their beautiful archaeological ruins. We will drive to a stunning viewpoint for a picnic lunch, and then visit the Quillarumiyoc temple (the Temple of the Moon). We will start our trek from here in the afternoon, heading by foot to Zurite where we have a picturesque stay in a colonial house. Tonight we will enjoy a traditional dinner and get a taste of the local village lifestyle. Approximate walking distance: 8km, Estimated time: 4hrs, Meals provided: Lunch and Dinner Option 2 - Classic Inca Trek This morning we go for a guided tour of the Sacred Valley, followed by a visit to the market town of Pisac, where we will have lunch. We then head to Ollantaytambo, where we will explore this impressive archeological site. Tonight we stay in a comfortable hotel. There is no trekking today. Meals provided: Lunch, Dinner, Snacks Option 3 - Train Package You will leave Cuzco with your fellow passengers who will be trekking the Wild Andes Trek. You will visit the fortress of Sacsayhuaman, followed by a beautiful scenic drive over mountains and through valleys, via the ancient city of Pisac and on to the Sacred Valley of the Incas. After lunch you will head back to Cuzco where you will stay at our nice, centrally located hotel for a further 3 nights. These hotel nights will be booked for you by your Tour Leader. Meals Included: Lunch INCLUDED ACTIVITIES. Visit the incredible remains of the Inca temples of Sacsayhuaman and the Sacred Valley on a guided tour: Included in kitty Take a guided tour of the fantastic Inca temples at Ollantaytambo: Included in Kitty Options for the treks from Cuzco (please see the bottom of the Trip Notes for more details): Included in Kitty Option 1 - Wild Andes Trek Hike on unspoiled Inca Trails through the stunning remote Andean scenery away from other tourists, on our exclusive Wild Andes Inca Trek. If you choose this option you will get a small refund from kitty. 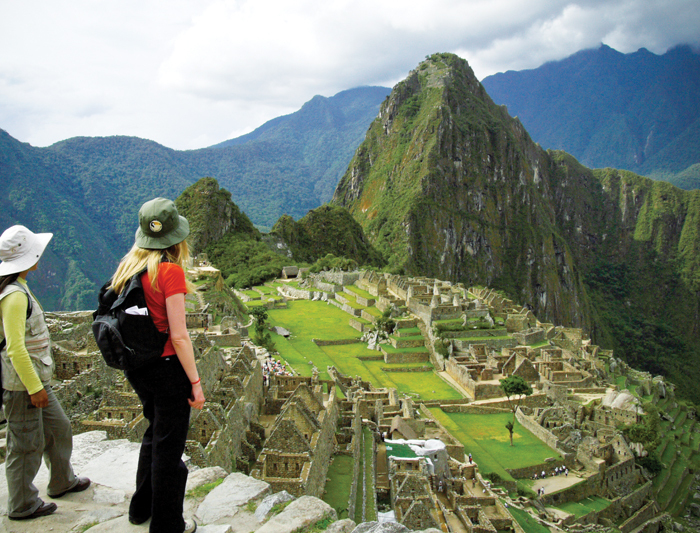 Option 2 - Classic Trek Trek the Classic Inca Trail up the Royal Inca Road. Your kitty has been budgeted to accommodate for this option as it is the most costly of the 3 options. Option 3 - Train Package (non-trekking option) Relax in Cuzco and take the train to Machu Picchu without trekking. If you choose this option you will get a substantial refund from kitty. Important note: You must advise us at the time of booking if you wish to book the Classic Inca Trail or the Train Package (non-trekking option), otherwise you will automatically be booked onto our Community Trek. About Sacred Valley: The valley of the Urubamba river is more often referred to as "The Sacred Valley". In the Peruvian highlands close to the Inca capital of Cuzco, the valley extends from the small market town of Pisac to Ollantaytambo, nestling at the foot of the Andean mountain ranges that are home to the magical lost Inca city of Machu Picchu. Together with Machu Picchu itself, the Sacred Valley was a cradle of the Inca Empire and the area is littered with archaeological sites including the magnificent ruins of Pisac with its famous terraced fields, the old temple complex of Sacsayhuaman and the remarkably well-preserved Inca city of Ollantaytambo. Together with the temperate climate, lively markets, sleepy Andean villages and stunning surrounding landscape, the rich history of the area makes it a truly bewitching place. About Inca Trail : When people talk about "The Inca Trail", they are usually referring to a particular trekking route that follows a ancient pathway that leads to Machu Picchu. However there are a huge number of Andean Trails that crisscross the Urubamba Valley and surrounding mountain ranges, many of which are genuinely remote and rarely used by western tourists. On our Dragoman tours that travel via Cuzco we offer you the choice to trek either the Classic Inca Trail or our unique alternative, the Community Inca Trek, which is exclusive to Dragoman. The Classic Inca Trail The Classic Inca Trail route usually starts at Kilometre 82 of the Cuzco-Aguas Calientes railway, taking in Abra Warmihuañusca (Dead Woman's Pass, 4,200m) and the ruins of Phuyupatamarca and Wiñay Wayna en route, eventually arriving at the Sun Gate above Machu Picchu early in the morning after 3 days of trekking. This route is still extremely popular as it is seen by many as the original Inca Trail, and it is also probably the best trek to choose if you're really interested in history and archaeology, because of all the smaller Inca sites it passes along the way. Unfortunately, due to its own popularity, the Classic Trail is always very busy, with around 500 people starting the trek every day - due to there being restrictions on camping areas, the campsites are often very busy with other trekkers as well. Nevertheless it is still an awesome trek, passing through some stunning scenery from snow-capped peaks to abundant cloud forests, and the sense of achievement you'll have when you catch your first sight of Machu Picchu is something you'll never forget. Please note that the Classic Trail is always closed for maintenance during the entire month of February each year. The Community Inca Trek Dragoman's Community Inca Trek is a unique trekking route where you'll hike through pristine unspoilt Andean scenery, walking ancient Inca Trails and pass through local communities as part of our pioneering community-based tourism project, Tarpuy Yachay. This trek is all about getting away from the overcrowded thoroughfares of the Classic Inca Trail and getting out into the real Andes - not to mention being part of a project with provides a genuine, direct benefit to the host communities we travel through, by supporting education, income generation and environmental sustainability projects. The trek itself is about the same as the Classic Inca Trail in terms of length and difficulty, taking three to three and a half days and ascending to about 4,700m when you cross the highest pass. The scenery out here is truly magnificent, spectacular mountain peaks, verdant hillsides dotted by isolated villages and the odd llama and alapaca, you are unlikely to see another tourist here. Although you won't trek into Machu Picchu via the Sun Gate as on the Classic Trail, you will arrive to Machu Picchu well rested after a night in a comfortable hotel and ready to get the most out of the tour of this magnificent site. Option 1 - Wild Andes Trek Zurite to Amaruwatana After a hearty breakfast we leave Zurite and head to wards Amaruwatana camp. The walk will take us through Qenteqentiyoc (the Hummingbird Temple), where we will visit and admire this archaeological Inca site. We will then follow the ancient path all the way to the top of our first pass at 4,400 metres, where we will have a dramatic view of both the Vilcabamba and Vilcanota mountain ranges. From here we start walking down on the way to our first camp in the Sambor Valley where we will spend the night camping. Approximate trekking time: 7-8hrs, Distance: 13km, Meals provided: Breakfast, Lunch, Dinner Option 2 - Classic Inca Trek Ollantaytambo to Wayllabamba After breakfast, we catch a bus to the Railroad 82km marker, the start of the Classic Inca Trek, here we are joined by our crew of local porters and cooks. We will cross the bridge over the River Urubamba and following a trail along the left-hand shore of the river, we enjoy stunning views of the snow-capped Mount Veronica (5830m.) and the Inca archaeological remains at Llactapata. Continuing through lush farmland and woodlands, we gradually climb for approximately 5 hours to our first campsite at Wayllabamba (3000m./9840ft.) Approximate trekking time: 5-6hrs, Distance: 12km, Meals provided: Breakfast, Lunch, Dinner, Snacks Option 3 - Train Package Dragoman Today is a free day for you to enjoy Cuzco, with its museums, churches, incredible colonial architecture, beautiful restaurants and a vast array of shops, selling textiles and handicrafts. Option 1 - Wild Andes Trek Amaruwatana to Ancascocha We have an early start this morning, trekking for approx. 2 hours to reach the top of our second pass at 4,700 metres. From here we have fantastic views of the rock formations below us, and if we're lucky we may spot Andean ibises, cascaras, eagles or foxes up here! After descending for approx. 2 hours, we arrive at a stunning highland valley with a glacial river named Kenqo Mayu (Zig-zag River) flowing down it - which makes an idyllic stop for lunch! After lunch we will continue trekking downhill following the ancient trail, which leads us to our campsite in the Ancascocha area. Approximate trekking time: 6-7hrs, Distance: 10km, Meals provided: Breakfast, Lunch, Dinner Option 2 - Classic Trek Wayllabamba to Pacaymayo This is the most challenging of the trek as we ascend a long steep path (approx 4 hrs) to reach the highest point of our trek, Warmiwañusca, or Dead Woman's Pass, at a height of 4,200 m (13,779 ft), before descending to the Pacaymayo Valley (3,650 m above sea level - 2 hrs downhill). Depending upon local conditions, you might camp here today, or may need to continue further up and down. We might cross the first and second passes on this day. From the second pass, Runkuracay (3,980 m above sea level - 90 min uphill) we can enjoy views of the snow-capped Cordillera Vilcabamba before descending to the ruins of Sayacmarca (2 hours downhill). From here it is only a few more minutes to the Chaquicocha campsite (3,620 m above sea level). Approximate trekking time: 6-7hrs, Distance: 11km, Meals provided: Breakfast, Lunch, Dinner, Snacks Option 3 - Train Package Today is a free day for you to enjoy Cuzco, with it's museums, churches, incredible colonial architecture, beautiful restaurants and a vast array of shops selling textiles and handicrafts. Option 1 - Wild Andes Trek Ancascocha to Ollantaytambo T Today we will descend the narrow Silque Canyon, allowing us to observe the tall granite walls on its sides which are populated by a large variety of orchids and bromeliads, filling the environment with magnificent colours when they bloom. After crossing many little bridges we will reach the Camicancha area, where we stop at a magnificent volcanic viewpoint looking to wards the Snow-capped Mt. Veronica. From here, it is only a short trek to Chilca, where out trail ends. We'll be picked up by our vehicle and head to Ollantaytambo, taking a well-earned shower and rest at our hotel. In the afternoon we will have an included guided tour around the incredible archaeological site of Ollantaytambo and its world-famous Temple of the Sun. Approximate trekking time: 5hrs, Distance: 12km, Meals provided: Breakfast, Lunch, Dinner Option 2 - Classic Inca Trek Pacaymayo to Winay Wayna Today we continue over the third pass and soon reach the beautiful ruins of Phuyupatamarca, the 'Town above the Clouds' (3,850 m above sea level – 90 min uphill). Start descending real Inca Steps (2 hrs) to reach our final night's camp by the Wiñay Wayna, or 'Forever Young' ruins (2,750 m above sea level), with panoramic views of the valley below. Approximate walking time: 8 hours, Distance: 16km, Meals provided: Breakfast, Lunch, Dinner, Snacks Option 3 - Train Package After being picked up from your hotel in the morning you will be driven to the fortress city of Ollantaytambo and our hotel for the night, the Tunupa Lodge. Here you will rejoin the Community Inca Trekkers and your tour leader who will be arriving from their trek this afternoon. Option 1 - Wild Andes Trek Ollantaytambo – Machu Picchu – Cuzco Today we will have an early start to catch the train to the small town of Aguas Calientes. From there, we will take a bus up the winding mountainside to the legendary ruined city of Machu Picchu - one of the world's most iconic sights! We have a guided tour with our expert local guide and plenty of time to freely explore this magical place. In the afternoon we will head back to Ollantaytambo and then on to Cuzco, where we return to our joining hotel at the end of a long but phenomenal day! Meals provided: Breakfast Option 2 - Classic Trek Winay Wayna to Machupicchu Today we wake early for a short final hike to Machu Picchu, we climb the steps to the Sun Gate to watch the ruins emerge from the mist below. As with the community trek our guide will show us the most important constructions as well as explain the history and the mythology of this magnificent place. There is some free time to explore the ruins further at your own pace or maybe if you haven't experienced enough steps and trekking, why not visit the Inca Bridge. Or you can just chill out and watch the hummingbirds or vizcachua. In the afternoon we head back down to Aguas Calientes and take the train back to Ollantaytambo and return to Cuzco for a well-deserved rest. Approximate walking time: 2 hours, Distance: 4km, Meals provided: Breakfast, Snacks Option 3 - Train Package After an early breakfast and walk to the train station, your stunning 2 hour train ride to Aguas Calientes begins. The journey takes you through several different micro-climates, past Inca terraces, lookout posts, ancient river bank reinforcements and small towns. You will get a glimpse of different temples and the beautiful Mount Veronica (5,750m). Passing through 8 tunnels, the train journey finally comes to an end in the busy pueblo, Aguas Calientes. From here you take a local bus that winds up the mountainside for about 30 minutes until you arrive at the entrance to Machu Picchu (2,400m), the awe inspiring 'Lost City of the Incas'. The guide will take you around the immense, mystical ruins for about 2 to 2 ½ hours, explaining the rich history of the ancient site. Afterwards, you will have time to explore on your own before returning down the mountain to Aguas Calientes. In the afternoon you will catch a train from Aguas Calientes to Ollantaytambo and a private transfer will take you back to your hotel in Cuzco. Meals provided: Breakfast INCLUDED ACTIVITIES Explore the phenomenal and iconic Inca ruins of Machu Picchu, one of the New 7 Wonders of the World - take a guided tour and have plenty of time to freely explore before returning to Cuzco : Included in Kitty About Machu Picchu: Machu Picchu is a world-famous 15th-Century Inca citadel perched 2,430m above sea level on a mountain ridge above the Sacred Valley. One of the historical highlights of the world and a phenomenal icon of Peru, the ruins have been a UNESCO World Heritage site since 1983 and was voted on of the New Seven Wonders of the World in 2007. Machu Picchu was most likely built as an estate for the Inca emperor Pachacuti (1438–1472), and is thought to have been built in around 1450 but abandoned after the Spanish conquest in the 1530s. Although the city remained known about by the local Quechua people, it was undiscovered by the Spanish during the colonial period and remained unknown to the outside world until American historian Hiram Bingham discovered it and brought it to international attention in 1911. Machu Picchu was built in the classical Inca style with intricately-designed dry-stone walls built without mortar - it has three primary structures: the Inti Watana, the Temple of the Sun, and the Room of the Three Windows. Most of the outlying buildings have been reconstructed and restored, and the iconic steep mountain of Huayana Picchu looms over the site. The city consists of more than 200 buildings, from houses to temples, storage buildings and public spaces. It's fascinating to be able to gaze down on the city from above and imagine how it would have looked during the height of the Inca empire. A visit to Machu Picchu is a major highlight of any adventure tour to Peru. A genuinely magical place, catching your first glimpse of the Inca city through the early morning mist is definitely a moment you’ll never forget.